Hello! This week the challenge in Three Muses is MAPS and I decided to take advantage of my recent travel to Cuba to acomplish it. So, here it is a glimpse of this fascinating country (please enlarge to see the details). I googled all the old maps; the photos are all mine and so it is the texture. Such beautiful buildings! I never think of Cuba as a place to visit. Great collage. What a lucky lady I hope you had a fabulous time...your photos are beautiful and the collages you made are fantastic...great job Chris!!! Super collage, Christine! I like the way you presented the information on each photo. I found that if I unchecked the Google "stay signed in" box, I could leave comments without a problem! Maybe it will work for you, too. Beautiful collage and memento of you visit. 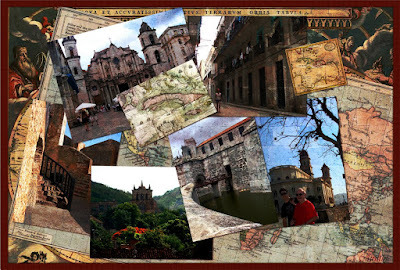 Oh boy - makes me want to get up and go on a journey- fantastic travel collage Christine! This is so wonderful, Christine. What a great idea to create the added piece outlining exactly what the photos are. Beautifully created! What a beautiful montage of your trip to Cuba. Thank you so much for sharing these photos with us, and I really appreciate the time you took to give us the history of each photo as well. A thoughtful entry, Christine. Good work! 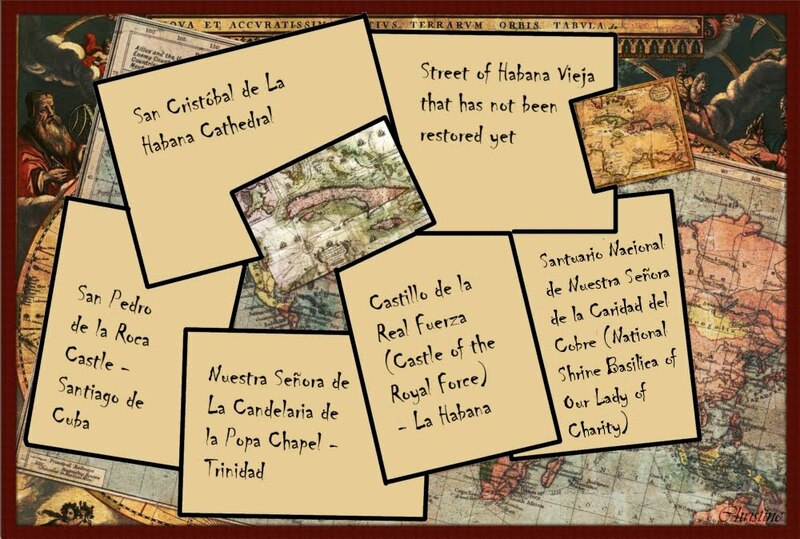 What a fantastic 'memory board' of your trip to Cuba, Christine, excellent take on the theme! What a beautiful travel memory. And Cuba looks like a wonderful place to visit. Your travel collage is really interesting. I like how you displayed the info about the photos as well. A beautiful montage of your holiday, Christine, and then to take the trouble to make a second piece containing all the information to go with them is outstanding. Beautiful for us to look at but also something to keep for your family also I would think. Excellent!!!! Thanks for sharing the process too!!! Such a wonderful digital collage.